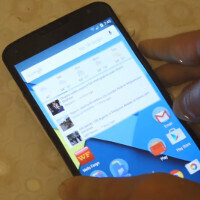 A giant, 6-inch QHD display, powerful quad-core Snapdragon 805, an optically-stabilized, 13-megapixel camera – those are all attributes that we now recognize the Google Nexus 6 for. But water resistance? Not really. The truth is that both Motorola and especially Google are keeping mum on this one quality of the newest Nexus device. That said, at least Motorola lists the phablet as "water resistant". That's right, "water resistant", not IP-certified, as we've come to expect from waterproof devices (e.g. Samsung Galaxy S5), and that's thanks to nano-coating that Motorola has become quite fond of – we've seen it with the Moto G, which can survive quite the dive, but also other recent Motorola devices like the Moto X (2014). But can you actually rely on the Nexus 6 to survive a drop in water? As it turns out, the answer is yes, at least judging by one particular YouTube video that has the main protagonist, the Nexus 6, dipped in a bathtub (whilst wirelessly-charging, too!). Sure, we still don't know if the massive gadget can withhold water for the heroic 30 minutes that the Moto G handled a while back, but it appears safe to say that it'll manage accidental drops pretty well. According to the author of the video, who took to xda-developers to share the tale of his exploit, the Nexus 6 behaved normally even several days later, which is all that everyone was hoping to hear. We'd know for sure if Google and Motorola got their act together and actually kept it in stock. Cool..still trolling, I see...I ordered the phone the first day it arrived on t mobile and it arrived last Monday. If it goes out of stock, then that just means it has a good demand. Also, they are probably controlling how much stock they get in at one time, as they probably did not know how many millions of units would sell. What you said was troll post, not truth. Oh look Google Play Store shows it out of stock unsurprisingly. So tell me exactly how my comment was trolling? You'd think after several launches, Google would get their act together. Motorola of course can't seem to do any better if the Moto 360 is to go by. So again tell me how that's trolling? The carriers have them :). My guess this is google's way of pushing the phone out publicly to the carriers in place of android silver. no stock with them but plenty of stock at the carrier retail level. Still the same phone no problem. I have an att version. Just set up with out sim installed and bloat ware will not appear. just root and unlock bootloader and you can get rid of att start up. pretty simple stuff to do. Tell us how availability relates to this story above again? So they botched the launch just like Microsoft did with their sport band. We're not talking about sport bands. This is where the Nexus 6 beat the Note 4 hands down. Try it out with your Note 4 and you will cry for your $800 as Samsung don't care about people by making the Note 4 not water-resistant. I will make sure not to get my Note 4 wet. Thanks for the pro tip. I will remember that when I swap out my battery for a fresh one this morning. Since my Nexus 6 charges up very fast, I am not concerned with having an extra battery, and it lasts quite a long time, the entire workday. Yea but when that battery quickly degrades in performance from people using that handy dandy turbo charging all the time. Note users can by a spare off amazon for under $10,while nexus users have to send their device in for a +100 replacement. Considering I have insurance, a case, & that in 11 years of owning cell phones, I've never dropped mine in water, I'm not too worried about my Note 4 when it comes to that scenario, but thanks for your concern. Unless i am James Bond or something why the heck would i want to charge any electrical device under water. Why? You got the money to risk that, you need help. On a side note, I'm impressed by the iPhone 6 & 6+ ability to charge fully in 60 seconds by putting it in the microwave.